This is a tutorial on how to make these cute Easy DIY Bunny Easter Gift Bags. Need a clever, easy Easter Bunny Craft idea? 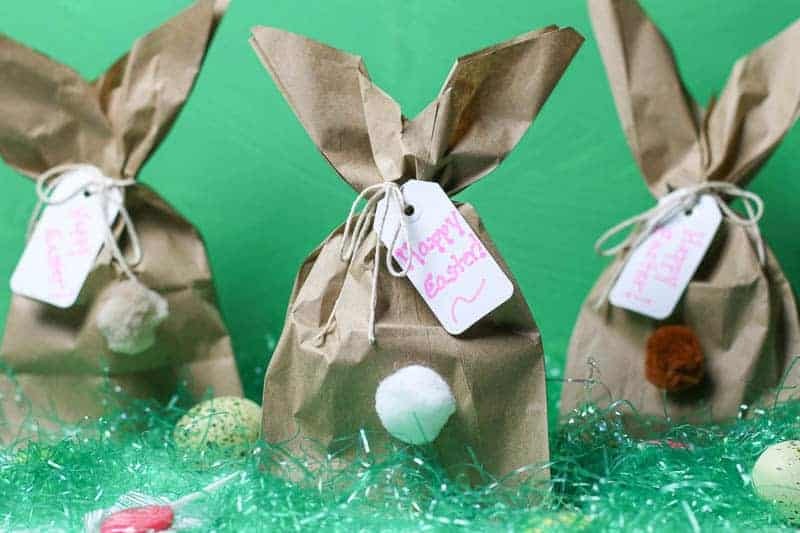 How about making these fun Easy DIY Bunny Easter Gift Bags? Turn a paper bag in to these cute little bunny butts. They are perfect little Easter gift bags for classmates, Sunday School, family, and friends. Easter is around the corner and now I am making these cute little Easter Bunny Gift Bags for my Mother’s classroom. I am filling them up with candy, small toys, and pencils. I can’t wait to see their smiling faces when I give these cute goody bags to them! My Mother is a teacher. For Valentine’s I made her class adorable DIY Valentine’s Day cups filled with all kinds of goodies. Her class loved them. Now I am busy making these sweet little bunny bags. Are they not precious? The little cotton ball tail makes me giggle. The Easter goody bags are so easy to make. You can whip them up in just a few minutes. 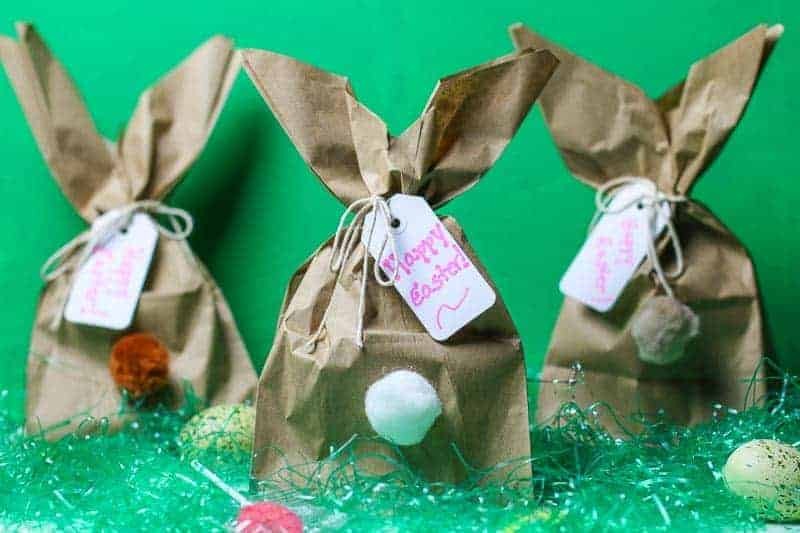 Follow these steps to make your own Easter Goody Bags! 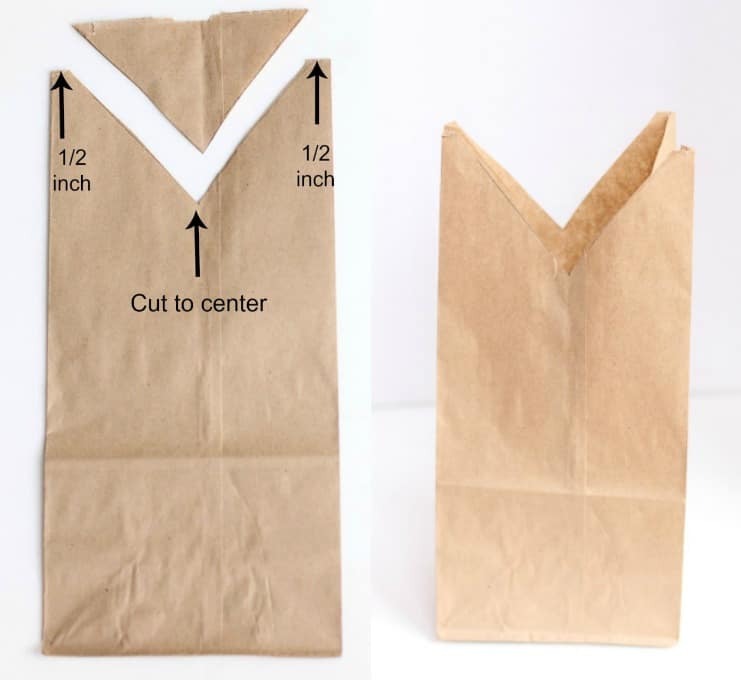 Take a ruler and about a 1/2 inch out draw a diagonal line to the center of the bag. On the other corner at about a 1/2 inch out, draw a line to meet the other line. Your bag should look like the second image above when it is cut correctly. You then fill it with your goodies. towards the bottom of bag to create the bunny tail. If you don’t want to use white, you can use any color. The bag will be cute no matter what color pom pom you use. Then you tie with twine. You can tie in a cute little gift tag with a message also. I tried ribbon and I was not happy with the result. Twine works best. The tighter you pull and tie the string, the pointier the ears will stand. Easy peasy right? *Note if you use a smaller bag, you won’t be able to fit much in it. The pattern will have to be adjusted a bit also. If you do not use this link to get your bag, I suggest a 12x6x4 size lunch bag or close to that size. That is it! My Mother’s Class will love these. Now be sure to check out my tutorial on How to Decoupage Easter Eggs. I have some of the most beautiful Easter Eggs placed all around my house. They are miniature pieces of art that I enjoy looking at every year and such a fun project to do with the family! Ever wonder how the Easter Bunny Come to be? Fun facts! The Easter Bunny (aka Easter Hare) originated from the German Lutherans. The Easter Bunny kept an eye out on the children during Eastertide. The Easter Bunny brought colored eggs, candy, and sometimes small toys to the well-behaved children the night before Easter. When the children woke up, they found their Easter goodies. Looking for more Easter Fun? Check out these cute Easter Posts that will make you hoppy! Need a clever, easy Easter Bunny Craft idea? This is a tutorial on how to make these cute Easy DIY Bunny Easter Gift Bags. With a ruler, draw a diagonal line from bout a 1/2 inch to the center of the bag. On the other corner at about a 1/2 inch out, draw a line to meet the end of the other line creating a triangle. Hot glue pom pom to bottom of bag. 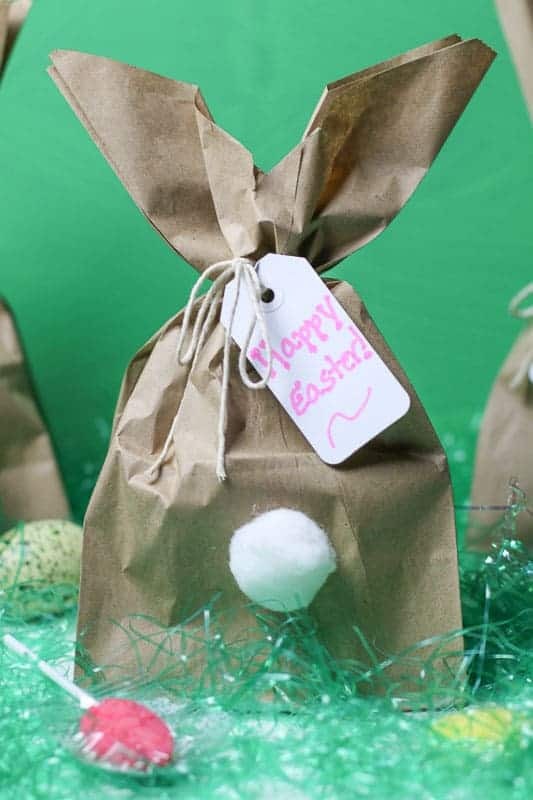 Tightly tie bag with attached gift tag to create bunny ears. Absolutely the most adorable idea ever! I can’t wait to show my daughter, who is obsessed with DIY crafts. Perfect for Easter.